The selection of pumpkins at the Chester's Pumpkin Patch and Farm will knock your orange socks off. The petting zoo at the farm is a favorite for the kids. 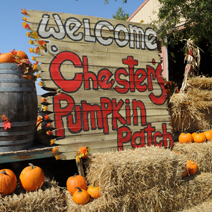 Just a few miles Northwest of Oklahoma City in the quaint town of Piedmont is Chester’s Pumpkin Patch and Party Barn. We had the privilege of spending a late morning on the fun-filled farm with Chester himself. Bright orange pumpkins and warm fall decorations greet visitors, creating the perfect festive, fall atmosphere. Chester, creator and owner, is the definition of a do-it-all man. He got his start making others happy 34 years ago working events and parties as a professional clown and family entertainer. Chester was actually Ronald McDonald for five years. He traveled across the nation working events as the famous clown, before McDonald’s changed their marketing campaign and sent Ronald McDonald into retirement. Picking out a pumpkin is only the beginning of the experience at the pumpkin patch; Chester’s is a place for memories to be made. “I get to be in the memory making business. I get paid to make memories. How cool is that?” said Chester. Of course, he offers the traditional experience of picking out the perfect pumpkin and taking it home, but don’t overlook the petting zoo, full of animals eager to be fed and petted. T-Bone, the 2,000-pound longhorn, loves getting his picture taken and showing off his giant horns. Recently, Chester built the world’s largest ant farm and it’s attracting national attention. Navigation skills can be tested by going through the three-acre mystery maze that ends with a giant slide. There is truly something for everyone who walks through Chester’s gates. During the month of October, Chester’s patch will see anywhere from 20,000 to 25,000 people, and around 40,000 for the year. Indeed, business has grown so much that Chester has gone from a one-man show to a farm with 28 employees—many are friends and family. The price is only $8 and seniors 65 and older are free. Chester tries to make everything reasonable because he truly want’s each mom and dad or grandparent to be the hero for the day to the little children. “Most people don’t have a lot of extra money to spend each month and we want to make sure that those parents or grandparents can be a hero in the eyes of the little kids,” says Chester. Navigating through the mystery maze, Chester explained what he believes everyone must have in life: a funny bone, wish bone, and a backbone. This means he wants everyone to be able to have fun no matter what they are doing in life, to always be able to wish, hope and dream, and to be able to make a decent living and stand for what one believes in. Taking care of the earth is important to Chester, which is why he recycles whenever possible. Many of the items on the farm are made from recycled or reused materials. And he is constantly thinking outside of the box to come up with new and different items for the farm for creating memories. For a dose of excitement, he is toying with the idea of a zip line stretching across the pond. Chester’s is ideal for groups. Schools, church groups and businesses sometimes utilize the farm as a venue for live entertainment, and campfires with hotdogs and marshmallow roasting. Chester’s Pumpkin Patch is open through Nov. 4, Monday-Saturday 9 a.m. to 6 p.m. and Sunday 1 p.m. to 6 p.m. They are ready to give everyone a spooktacular time full of great experiences, carving memories one pumpkin at a time. For more information, please visit www.chestersandcrew.com.